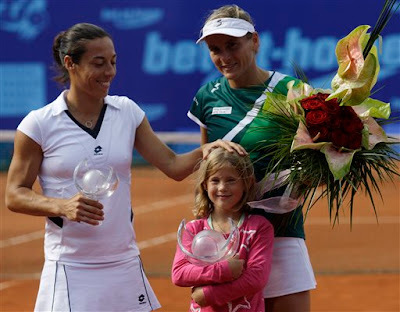 Olaru won, CSN lost to Malek, Safina beat a WC, Zakapalova won, Govortsova beat 3rd seed Kanepi. Wait, Kanepi is 3rd seed for Portoroz? ouch. Nice to see Katie O’Brien playing on the clay but isn’t there better things she could be doing? Zahlavova vs Zahlavova (Strycova) in Bad Gastein. Cornet will be hoping to turn around her recent poor form while she’s still in the top 50. Isn’t she supposed to be a clay courter? How cool is it to be Sybille Bammer's daughter? Moody Maria and architect Frank Gehry are designing some jewellery for the world number 61 to wear at the Open.